Letter, ‘Sapper’ (H.C. McNeile) to his agent, 1917. Archives across the UK and beyond have been examining their collections of records and personal accounts relating to the start of WWI just over 100 years ago. 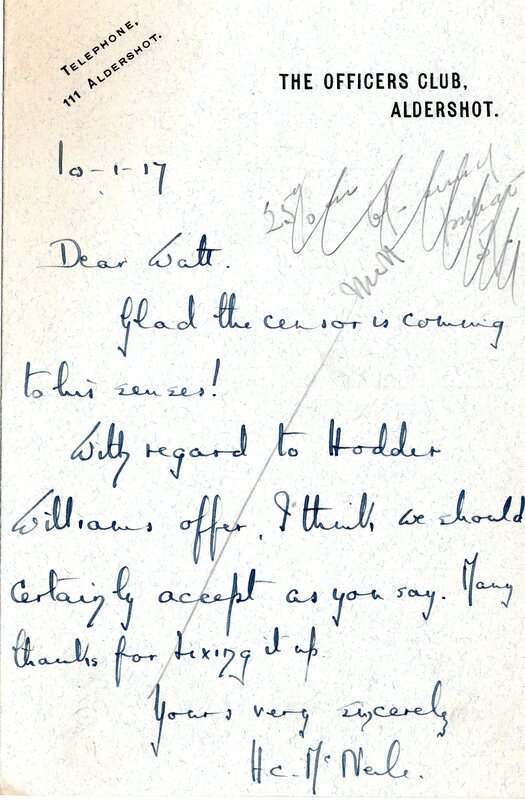 Recently available in our archive is a collection of 93 letters from Sapper (H.C. McNeile, 1888-1937) to his literary agent, AP Watt. 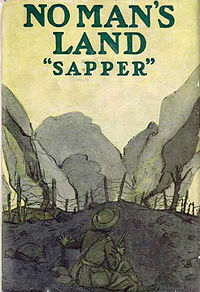 Sappers’ stories of the War were serialised in The Daily Mail, The Times and Strand Magazine and published as books by Hodder Williams (Hodder & Stoughton). His pen name was assigned by the owner of The Daily Mail, as serving officers were not allowed to publish under their own names. The letters, from 1914-1918, form part of the UEA’s recent acquisition of a collection from the world’s oldest literary agency, AP Watt. 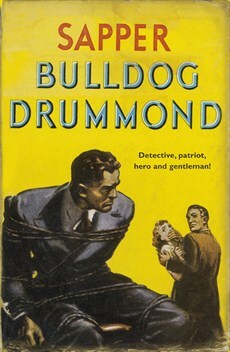 1st edition cover, published 1920. Sapper went on to write 10 ‘Bulldog Drummond’ novels but it is his earlier manuscript submissions of yarns, plays and sketches which are covered in these letters. All manuscripts were submitted to the Censor for approval but not all were passed, such as ‘The Man who ended the War’. McNeile writes of the vagaries of the Censor but that sometimes “the Censor is coming to his senses”. McNeile writes in 1918 of the Censor’s refusal to consider publishing his book until he has the consent of Sapper’s Commanding Officer. The irony was that McNeile himself was the Commanding Officer (being the Lt. Col. in command of a battalion). McNeile writes about play adaptations, his meetings with H.A. Saintsbury (actor and playwright) and Gerald Du Maurier (actor), and his wish to publish in The English Review – as he liked their politics. The letters originate from Folkestone; Aldershot; Farnborough; Woking; the 18th Middlesex Regiment, B.E.F. (British Expeditionary Force); King Edward VII’s Hospital for Officers; and Forres, Morayshire. In between times McNeile is serving in France and commanding a battalion.